TAITO CorporationYou can get the original pass case of TAITO! 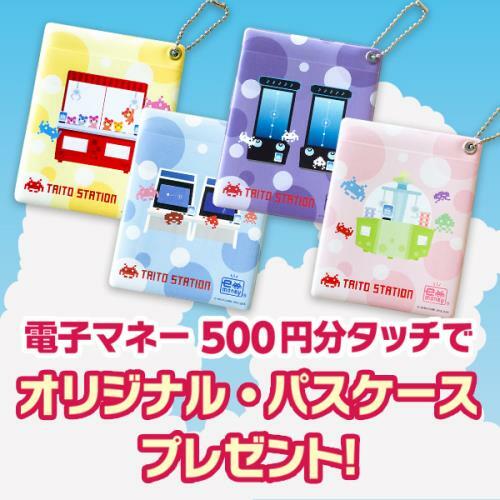 You can get the original pass case* of TAITO STATION for free when playing our arcade games worth 500 yen using Japanese electronic money cards from July 16 to August 31, 2016. We are also selling the original Japanese electronic money cards which are able to use at many shops in Japan and of cource at TAITO STATION to play arcade games! Please ask our store staff for more details before using Japanese electronic money cards. See you at TAITO STATION in Japan. *You can get it once a day. *You can choose from 4 different types of design. Some stores offer only 2 types of design. Please ask our store staff for more details. *You can get it as long as there is an available stock. *Image is for illustration purposes. Actual product may vary.